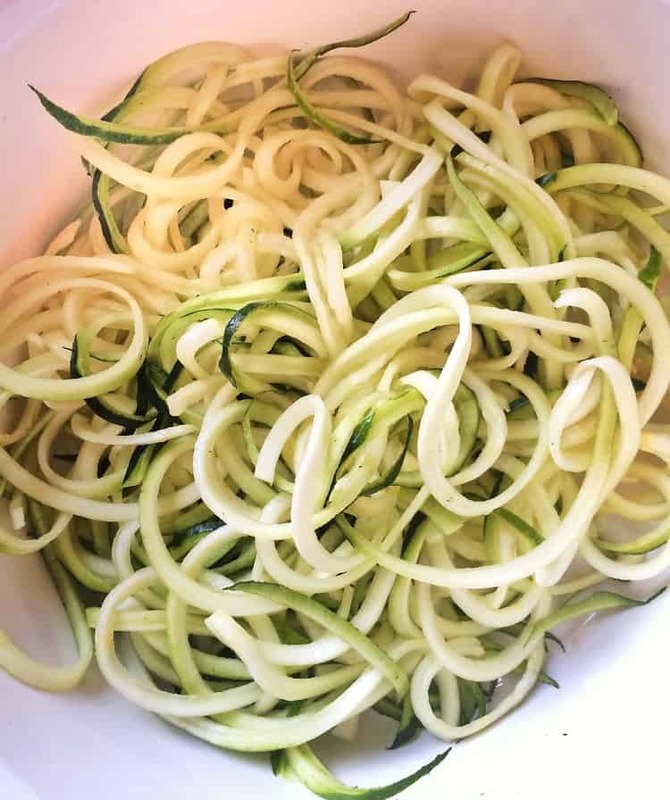 Here is my favorite new kitchen gadget: a spiralizer! Lately everywhere I turn I see these cool spiralized vegetable dishes and I couldn’t resist so I ordered one from Amazon last week for less than 20$. I felt like a kid with a new toy! 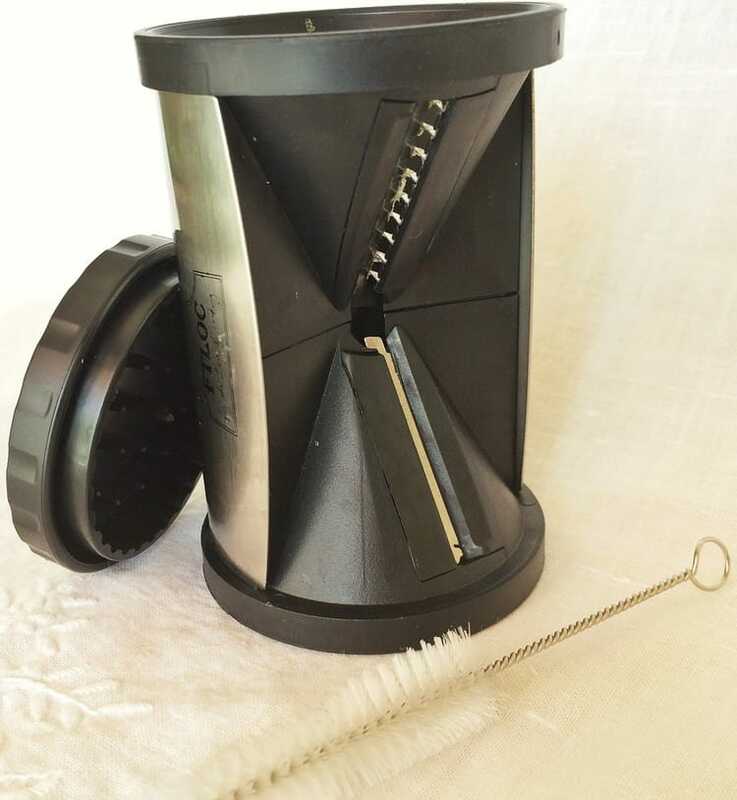 I’m not really into kitchen gadgets as I don’t like over cluttered kitchen cupboards and most of all, the more gadgets you have the more cleaning you have to do. I prefer to rely on my trusted knives or a plain old whisk rather than take out the food processor. But this little spiralizer is only about 5 inches high and comes with a small cleaning brush and storage bag so it fits perfectly in my utensil drawer, no clutter! Last weekend I was headed out to dinner without my family but I decided to prepare this side dish to go along with their steaks. I could tell my husband was skeptical about raw zucchini. So, I improvised this Spiralized Zucchini Salad with Cherry Tomatoes and Feta salad on the spot and off I went. I had a pleasant surprise upon my return: they loved the salad and it was all gone! The raw zucchini wasn’t an issue at all. 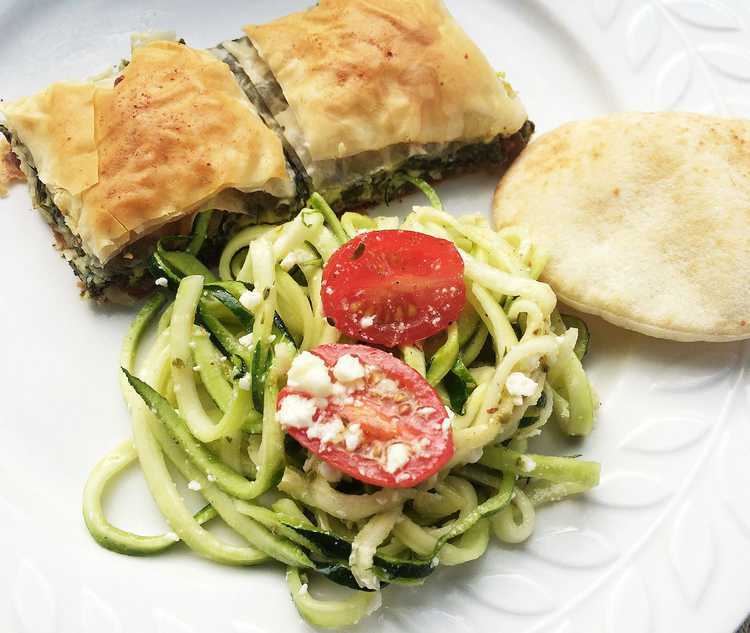 So I tried it myself this week as a side dish to my spanakopita and I loved it. To begin with, the process of spiralizing the zucchini is impressive. Each zucchini noodle comes out as one endless curly strand. You have to trim them at intervals of about 6 inches otherwise they are difficult to eat. I added halved cherry tomatoes, crumbled feta, oregano and made a simple vinaigrette of lemon juice and olive oil. The whole thing took 5 minutes, not bad for a last minute salad! 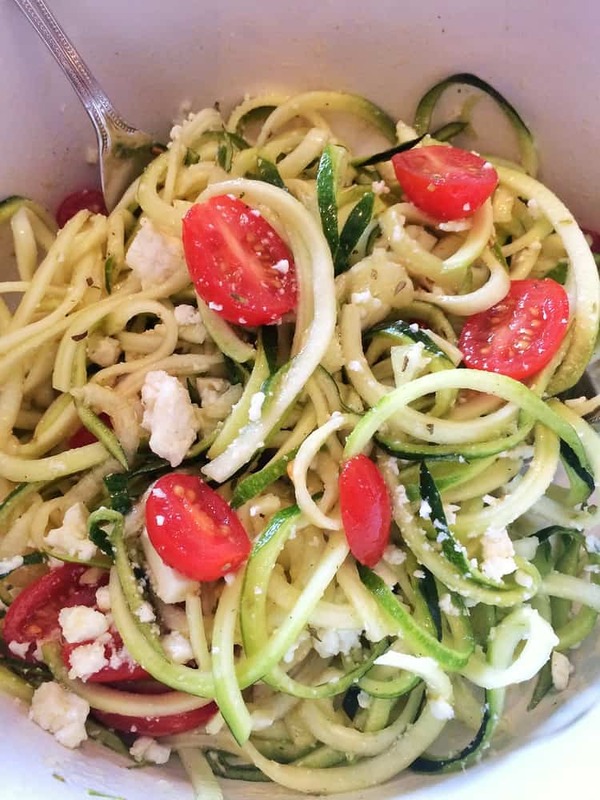 What a wonderful way to add vegetables to your diet: you can make quick salads or you can even sauté zoodles (that’s what they call zucchini noodles) and serve with tomato sauce. Oh my goodness, I sound like one of those infomercials! Now I’m wondering to myself, what else can I make? I did some research and here are some of the veggies and fruit that can be spiralized: potatoes and sweet potatoes, beets, turnips, butternut squash, cucumbers, cabbage, broccoli stems, and apples. Any firm vegetable or fruit will do and some may have to be cut so that they can fit in the small opening of the spiralizer. My children, of course, immediately thought of potatoes! Spiralized, fried potatoes, oh yes! Oh, oh, that means I’ve got to take out the deep fryer….stay tuned…..
Spiralize the zucchini in a large bowl. Add the cherry tomatoes and crumbled feta. In a small bowl mix the olive oil, lemon juice, and oregano. Pour over the zucchini, add salt and pepper and toss. Serve! Good tip about trimming the zucchini, the spiralizer is very effective at making super-long strips! Looks delicious Nadia! the spiralizer is definitely tempting!